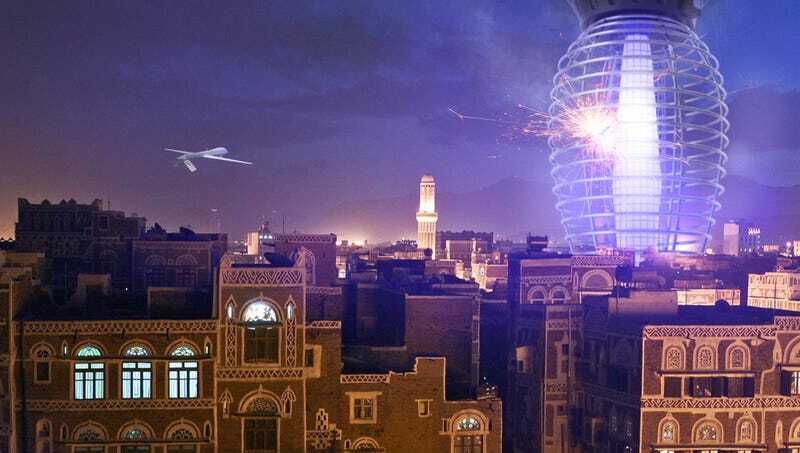 SANA’A, YEMEN—In an effort to address what has become a persistent nuisance to citizens, Yemeni officials unveiled Thursday their new 80-story drone zapper. “Hanging this state-of-the-art Drone Zapper above the nation means Yemenis will be able to enjoy themselves outside again and sleep soundly at night without the fear of being bothered by our pesky drone infestation,” said Minister of Public Works and Infrastructure Abdelmalek Saeed, explaining that the new devices will use a powerful, ultraviolet light to attract the unmanned military aerial vehicles native to the United States into a wire mesh grid that sends 2,000,000-volts of electricity through the troublesome aircrafts, eliminating them on contact. “Sure, the smell of burning electrical wiring can be pretty intense sometimes, and cleaning the charred remains up in the morning is a chore. But ever since the zappers were installed, residents have reported far fewer problems at weddings or outdoor parties.” At press time, Yemeni officials had ordered the nation’s drone zapper shut down after discovering the smoldering husk of a commercial airliner in the trap.